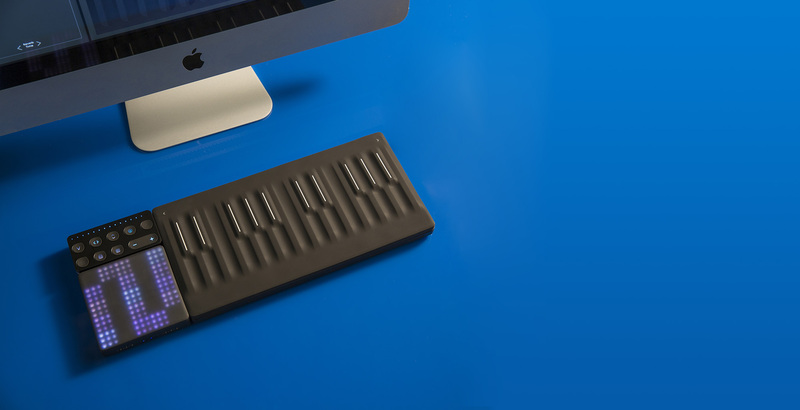 The Roli Seaboard Block has finally touched down in Australia. The latest addition to Roli's modular Blocks eco-system is a love child of their Lightpad Block and the Seaboard Rise a 24 'keywave' wireless keyboard with the same uniquely responsive surface as the other Roli Seaboard products, but snaps together with the Lightpad, Live, Loop and Touch Blocks or even another Seaboard Block if you want a bigger keyboard. It feels fantastic and is a hell of a lot of fun to use. The key bed utilises Roli's 5D touch technology gliding your fingers along the keys alters the pitch bend of notes while sliding your fingers up and down opens cut-off filter like effects. The Seaboard Block comes with four high-powered music production programs: NOISE (the iPhone app), Equator player, Strobe 2 player, Traktion Waveform, Blocks dashboard and MaxMSP. These range from allowing you to use the Seaboard block as a midi controller for popular DAW's to fully featured synthesizer sound engines with hundred of sounds to play. Roli seem to be going from strength to strength this year pushing the boundaries, creating more affordable but high-quality and innovative products. When the Lightpad Block was released early this year we saw Roli lay the foundations of their modular music studio eco-system. One of the great strengths that the Blocks range has been it's ability to find a place with people, regardless of their musical experience or knowledge. With just about everyone owning a Bluetooth enabled phone or computer these days, even beginners with a limited understanding of theory and technical aspects can straight away start using the devices to create melodic arrangements that work. While more advanced users may dig into the expressive capabilities via MIDI control with professional software like Ableton Live, Native Instruments' Massive, Apple Logic Pro or even write their own apps and instruments for Blocks with the available Roli developer kits. Take yourself into your local Roli dealer and give it a go.